Fresh figs are still appearing in our local markets and I love to combine them with goat cheese and a drizzle of honey. Since I had a friend coming over for lunch, I decided to make a salad that featured the figs and goat cheese. I like Ina Garten’s method of coating the slices of goat cheese with egg white, then quickly frying them. This makes the salad feel more appropriate for the cool, cloudy weather we have been having. I toasted some walnuts and added a little warm honey to a simple vinaigrette. Instead of the fresh breadcrumbs that Ina recommends to use in the final coat for the goat cheese, I used panko, my favorite Japanese breadcrumbs. All you have to do is prep the goat cheese, toast the nuts and assemble the salad while the goat cheese heats and browns. 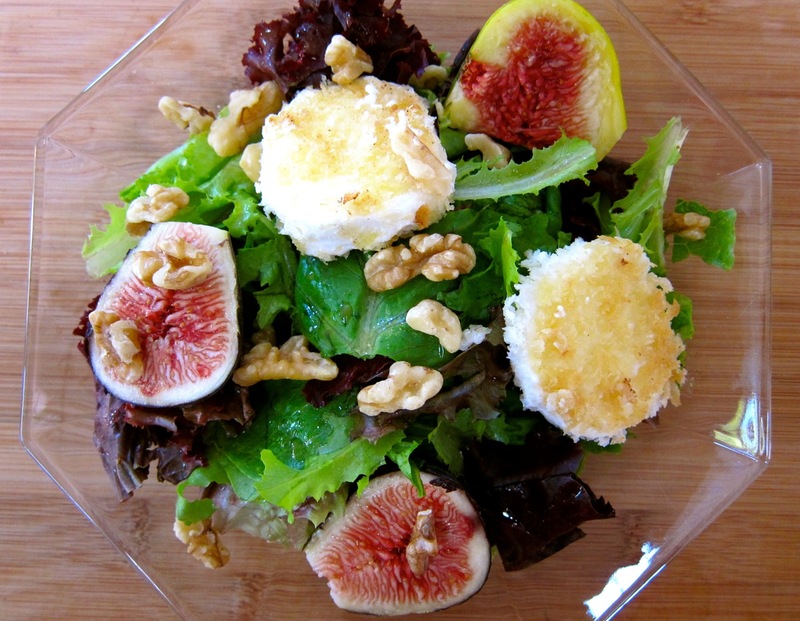 The warm goat cheese on the chilled salad with the rich taste of the figs is the combination I wanted to bring together. TIP: Use unflavored dental floss to cleanly slice the goat cheese. 1. Coat each slice of cheese with some of the egg white mixture. Dip slices in the panko and roll until coated. Set slices on a rack and chill in the fridge while you prepare the rest of the salad. 2. Heat a small skillet and add the walnuts. Cook until lightly toasted, stirring a few times. Once you smell the nuts toasting, remove the pan from the heat and set aside. 3. Prepare the vinaigrette in the bottom of a large salad bowl. First, warm the honey in a microwave for several seconds. To the salad bowl, add the vinegar and whisk in the mustard, honey and optional salt and pepper. Add 2 tablespoons of the oil and whisk again. 4. Add the greens to the vinaigrette and toss. Stem and halve the figs. Add the figs and toasted walnuts to the salad and gently toss. 5. Using a medium-sized skillet, heat the butter and remaining tablespoon of oil over medium-high heat. Add the goat cheese slices and cook until lightly browned on both sides. 6. Serve individual portions of the salad. Top each plate with 2-4 slices of the toasted goat cheese. Serve. Did you know our neighbor has a fig tree and they are willing to share so the big crows don’t eat them all. Thanks Wendy, I’m a big fan and the fig-goat cheese combo so we enjoyed it. This is just pure love on a plate! This looks like the perfect salad for an early fall day! I love figs and goat cheese together too – a match made in Heaven. And what a great idea to add warmed honey to the dressing!! Oh, and I love the photo, Liz! Thanks, Susan – like your new avatar! Thanks and hope the trip goes well – your ragu is on the menu tomorrow! Hi Liz. Thanks for stopping by my blog to say hello. Looking forward to meeting you in person at the photo workshop just 2 weeks away. Your salad sounds delicious and one of these days I’m going to have to try a fig…they look so beautiful, but somehow I’ve never eaten one. I love the family theme on your blog. The old photos and hand written recipes are great. This looks beautiful! I love the combination of figs, goat cheese, and honey. Figs and goat cheese are meant to be together! I enjoy reading your lovely blog and appreciate the warm family feel you create with photos and recipes. Hannah, thank you for your kind remarks – you made my day!